The Roces Family Around the World: Thunderbirds Are Go! --> Thundercats Ho!!!!! I could pick a number of battle cries that would cross many generations, the title of this entry spans quite some time. I have completed my part of Phase 2 and delivered it to Kain. I've also made my first installment payment to him. I've been carrying around a little metal notebook for the past 4 weeks. Instead of using my normal PDA, I've carried this notebook because it allows me to just write quietly and without much ado. Sometimes technology brings about it's own challenges, and having something be in analog is a nice touch. It will also allow me to keep a record my sketches and other layout designs, which had I formulated this directly onto a computer would be lost to the file system. Here it is. 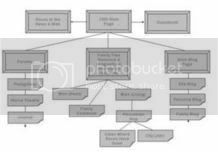 Here is the site layout or sitemap. Each beveled box represnts a main page or section and the tabbed parts are subsections or functions needed for the section. 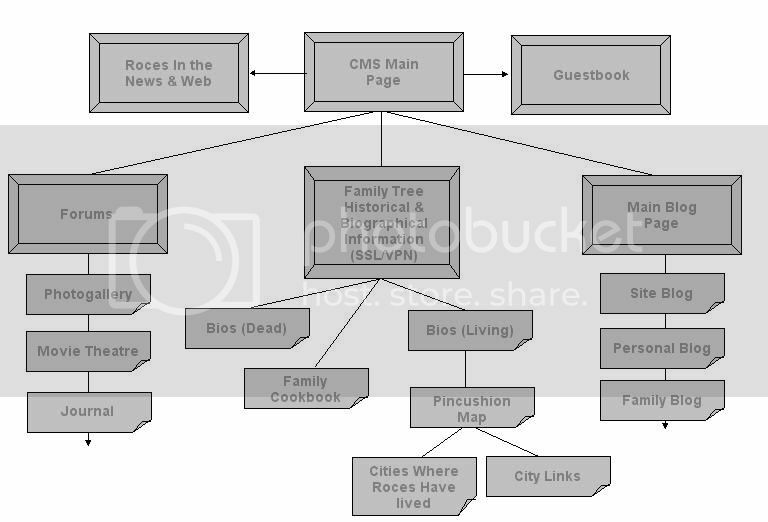 There are funcitions like photogallery and movies that will be part of the Family Tree/Bio area but for the layout I left them out since I know it's a prominent component for that section. The forum has it's own built in security as does the CMS Main Page so that I can make sure that general population information is available to the general public or casual visitor. It also will help me target the family directly and make sure that the information gets to the right people without question or difficulty. This distinguishes elements for the young generation and also is COPPA compliant. The family tree section is where the heaviest security is going to be a combination of SSL and VPN, some will just be SSL and others will be both SSL/VPN and require actual administration by a live person. I will also have to address the spiders like google and yahoo. I need to make sure that the have access to parts that are available to the general public and denied to the secured areas. The next step of Phase 2 is for Kain to deliver to me feedback and tweaks. He then will create some mock up pages so that we can see how the items flow together. This part will help us discover if there are any difficulties with data presentation and data flow. What this means to the layperson is that the story needs to be told in a coherent manner so that it flows naturally and is easily navigated.